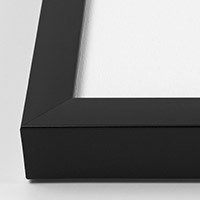 Make your photos stand out with a Framed Canvas Standouts. No matter your style, a Framed Canvas Standout adds a sleek look to any photo and turns your images into a conversation piece to decorate with at home or work. Your beloved memory is printed on high quality canvas with only the finest ink and surrounded by a smooth frame to ensure a timeless and elegant piece of wall art. Available in five popular sizes to fit any space. Arrives ready to display with hanging hardware attached, no assembly required. Images are printed on high quality canvas using custom, archival quality pigment-based inks. Framing available in a black or walnut finish.